Having a large screen television is becoming much more popular these days. Trying to recreate that cinema experience at home is also easier due to the fact that 40 inch or larger screens are a lot cheaper than they once were. Having said that one of the best parts of watching a movie is the sound. There's no point having the latest blockbuster movie beamed life size on to the wall if everyone has to huddle round the tiny speaker that's built into the television. The answer to this conundrum is to install a surround sound system to compliment the visual experience. With the right kind of audio setup you'll feel like you're much more part of the action. With deep bass and speakers specifically for dialogue or movement the movie experience will be much more impressive. Not to mention that there will be no annoying people rustling sweet wrappers and you won't have to spend a fortune on popcorn. There are a few ways to enter the world of surround sound. As with most things it depends upon how much you want to spend and how serious you are about your audio. The first option is the cheapest one and includes nothing more than hooking up some speakers to your existing television. Some will have connections for extra audio equipment that can give you improved sound output. This isn't really surround sound though and the amplifier in the television simply can't be as good a separate device designed specifically for the task. A surround sound amplifier takes the sound from a DVD player or TV signal and distributes it to speakers designed for the task. 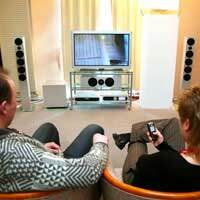 The most popular system uses five normal speakers and a special one called a sub woofer. Two speakers go either side of the screen and handle normal sounds. A central speaker is used for dialogue and then two speakers should be placed to the rear of the room for additional sounds and to enable the ‘surround’ effect. The sub woofer adds bass and depth to the audio. This is commonly referred to as a 5.1 surround sound. There are other possibilities with more speakers but 5.1 is currently the most popular type. The set-up of the speakers will of course, be determined by the layout of your room but there are several alternative arrangements that will enable you to get the most out of your audio set-up. Many manufacturers are adding surround sound capabilities to devices such as DVD players so that all the processing and amplification is handled in one unit. These devices are often also sold with all the speakers supplied so you have a fully functioning surround sound cinema experience without the need for lots of extra kit. When you’re buying a surround sound system it’s important to take a few things into account. If you’re unlikely to want to upgrade your speakers or system it’s probably best to go for an all-in-one system. This gives you the advantage of less equipment under your TV and saves you the hassle of shopping for an amplifier and speakers. If, however, you might want to change your speakers then it’s best to buy a separate amplifier and speakers. This will give you more flexibility in the future. Remember that any speakers you add to the tiny internal ones that come with most televisions will add greatly to your audio enjoyment. To get the full effects though it’s best to invest in the proper equipment. Hollywood blockbusters are greatly enhanced and even soaps will sound better with the right audio equipment.